Want convenience? Cheapness? Freshness? Good coffee? But don’t want to settle for anything unappetizing? Well, Ideal has you covered. This specialty bagel shop is located on one of Athens’ busiest streets in town (West Broad) with plenty of parking for everyone. (Ask any Athenian and you know that this is already a huge plus. Nobody wants to pay a parking meter if you’re simply trying to get a quick cup of Joe.) Need some grub and a caffeine buzz before a long day of hiking or exploring? Ideal will have your food and coffee out in an instant. 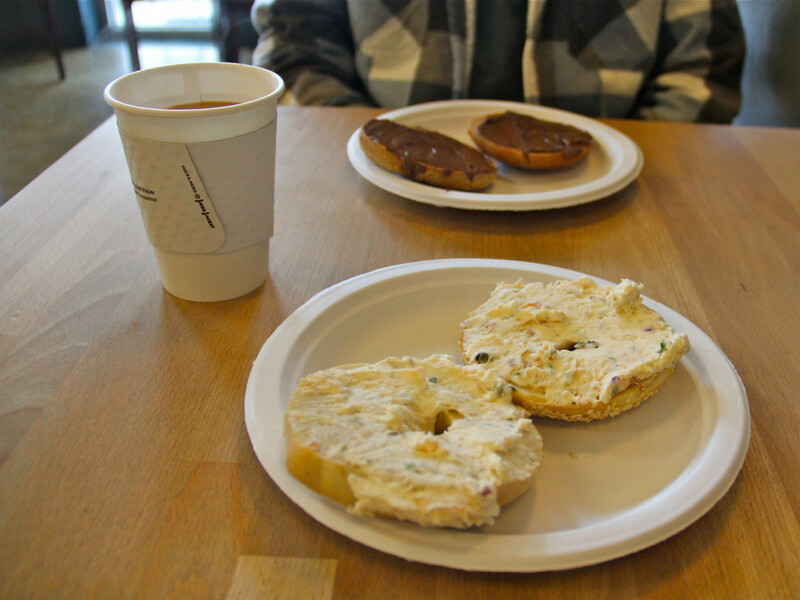 For only $3.25, you can get a cup of Counter Culture Coffee with a warm, fresh, buttered bagel. So why Counter Culture you might ask? 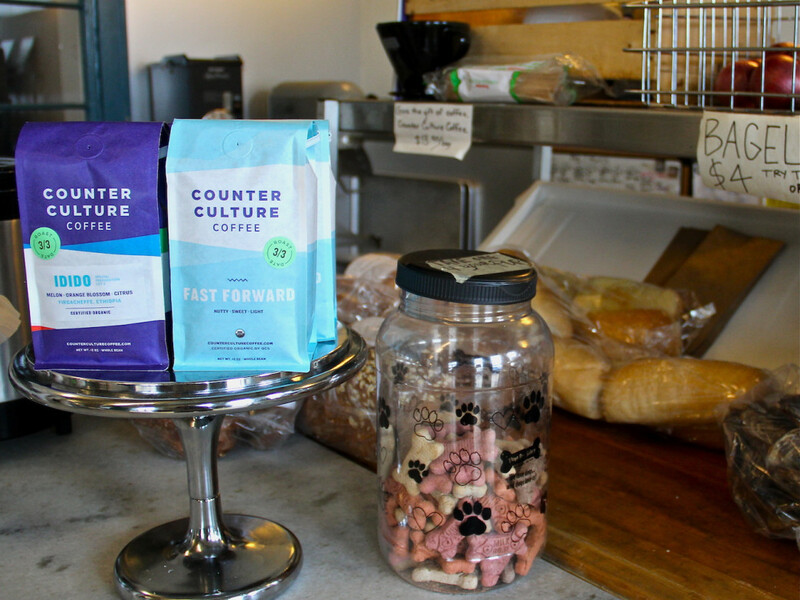 This roasting company is based out of Durham, North Carolina and for 20 years has specialized in selling to small coffee producers rather than a single grower or business. Ideal is a Georgia-owned cooperative that proudly supports the fair, fresh, and sustainable ethics at Counter Culture. Co-owner Matt Downes opened Ideal Bagel in 2013 as a side project to supplement some of his other restaurant endeavors. He is also the owner of Athens’ Luna Baking Co. and another esteemed Athens bakery called Ike and Jane . 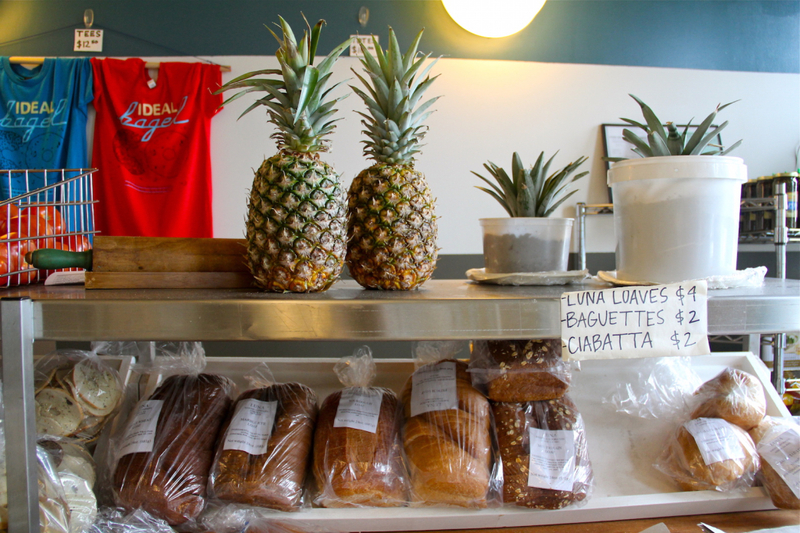 Inside Ideal you can find fresh-baked Luna baguettes and loafs for only $2-4 or add the slices to any sandwich. These uniquely seasoned breads are another perfect snack to pair with a to-go cup for a long day of activities. Bakers make selected bagels daily at Ideal. Co-owner and bagel “schmearer,” William Clarke allows his New York roots to show through when preparing Ideal bagels. Clarke says, “We boil and bake our bagels in house, to be golden brown and delicious.” The variety of these creations, from the bagels to the spreads will satisfy any palette, whether it's of the sweet or salty persuasion. Typical bagel flavors include, sesame, salt, pumpernickel, honey wheat, everything, and cinnamon raisin. Standard spreads are plain, whitefish, Nutella, sundried tomato, hummus, seasonal fruit, and peanut butter. 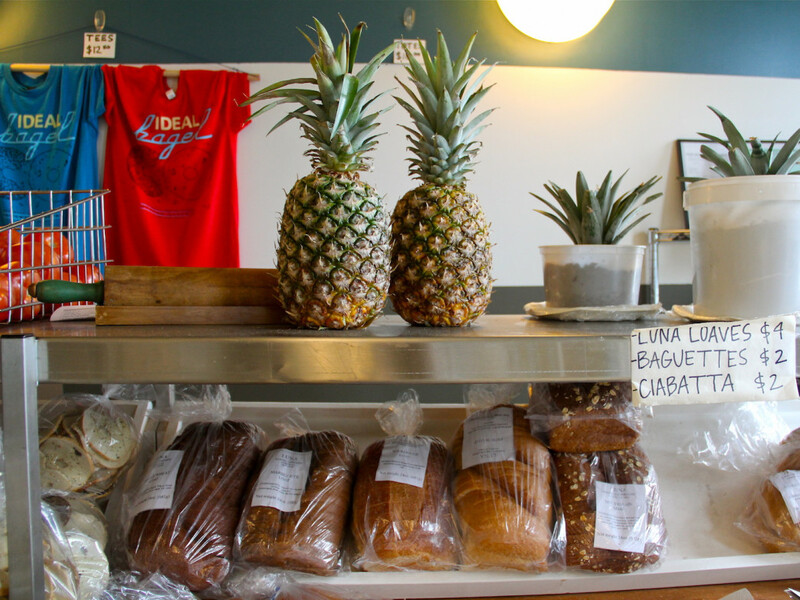 Ideal Bagel Co. offers specialty bagel and Luna bread sandwiches on their menu as well. One of the most popular items is the “House Fish Bagel” served with lox, capers, tomato, cream cheese, and either pecan smoked salmon or Georgia trout. Try “The Southernmost” if you want to feel just at home with a local sausage and grape jelly bagel. The restaurant takes its name from the knick-knack shop that formerly occupied the space, called Ideal Amusement Co. Having kept the original street and wall signs from this somewhat wacky shop, Ideal is now offers a fun, retro feel. There is plenty of space and Wifi for customers who want to post up for a few hours with a tasty meal (or two) and a book or laptop. Ideal is the ideal place to appreciate “great food, great coffee, [and a] great atmosphere!” says Clarke. Plus, if you come often enough the servers are sure to remember your name. Good cheap java, fast and sincere service, and locally made breads and bagels—what else could a townie (or visitor) ask for? Ideal Bagel is open from Monday-Friday 7-3 pm and Saturday 8-3 pm.